Ordering opened Thursday for the 1-ounce .9995 fine platinum ‘Liberty’ coin which features the second of three designs from the Mint’s Preamble to the Declaration of Independence series. As an early comparison, last year’s proof platinum ‘Life’ coin introduced the design theme and logged first-day sales of 4,420. It bumped up another 3,110 coins through the following weekend to post four-day starting sales of 7,530. Its sales currently stand at 12,411. 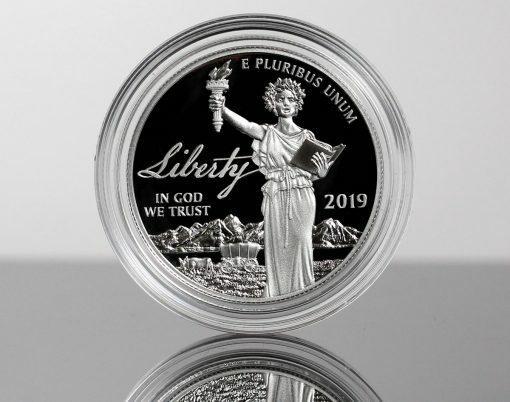 Priced at $1,220, the 2019-W Proof American Platinum Eagle is available from the Mint’s catalog of platinum coins or by calling 1-800-USA-MINT (872-6468). The coin has a mintage limit of 15,000. What’s with the face of Miss Liberty? Is it just the picture above or does she really look like the guy in Goonies movie? UGLY design, just like the previous one. Yikes ! Easy on the bourbon mint sculpture. The sketch rendering looked better. Maybe this is why the U.S. Mint refuses to display actual photos of coins on their website. I was actually considering buying one of these. What’s on its head? I couldn’t tell if it was supposed to be flames, a wreath of something, or snakes. Why aren’t there any reins on the ox? By the way “Sloth had less hair and one eye lower than the other, but very close indeed. What’s on the head looks to me like a tangled strand of Xmas lights – the old kind. And how about the fingers – ET?? I bought one at the mint booth at the Long Beach Expo. Tomorrow I have to pickup at PCGS. Honestly mine looks better than the picture on this post. That being said this design is definitely not as nice as the 2014, 2015 or 2016 designs. Hopefully it comes back proof 70 otherwise I think this will be worth less than issue price. But I never sell coins so I guess it’s not so important. Today the mint booth said they thought sales were going well. Yeah…Liberty looks like she just got her wisdom teeth extracted and is just waking up from the anesthesia. Very low sales numbers for a new 3-year series that started last year. Maybe the issue price scared some collectors. This will not sell out. The design was not my choice but bought one anyway. Mint has already shipped. A welcome change from their handling of the Apollo coins. IMHO sale problem is also because many of us wanted the Apollo coins and $ are limited but design and price did not help either. Without a DOUBT, that is the ugliest obverse & scary arse look you can imagine.. Must be an 0ptical illusion, like Tats on Maroon 5…….or braces on a wrapper …naah this is so fuguly makes the WW1 $ look like the Mona Lisa…. can i have my 3 years old do the designs, she’sbetter! @Chas…Gonna have to agree with you this time. Her face is enough to stop a clock. Perhaps the designer is trying to tell us something about what has happened to our “Liberties” now-A-days ? What with all the anti-Constitutionalist commies we now have in power, trying to strip us of our God Given Rights. She looks like someone snuck up behind her and is trying to, well, never mind. I think the designer did it on purpose as a testament to the danger we are in. So I officially picked up mine at the Long Beach coin expo Saturday and it graded PF70DCAM!!! While I was at LAX security saw my coin and she said it was a beautiful coin. A lady behind her said her son like coins and works somewhere that makes them. She told TSA I was her son and she literally Stole it!!!! TSA reviewed the cameras and caught her. She said she thought it was her sons. TSA didn’t believe her but unfortunately did not arrest her. She did have other medals or coins also. Weird experience just glad I got it back after 20 min. Security said if I would have done that I would be going to jail. If that’s a beautiful coin, I must be going blind. Good luck with your PF70DCAM!!! I wouldn’t buy it for spot price. I just picked up my coin. In fairness, its not too bad-looking. The picture above is just about as unflattering as you can get. Roll on 2020. I’ll buy the last one and be done paying a huge premium for something I can live without. I doubt I’ll be buying any more ‘series’ like this one. It appears the young lady had a stroke. Perhaps it is one of those “intentional mint errors” they said they were going to release in the wild this year.